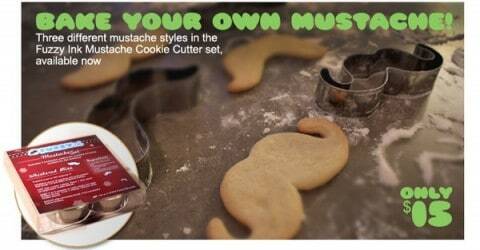 Moustache Cookie Cutters? The madness must end! I think this whole moustache trend might have gone too far, seeing as now you can bake cookie in the shape of a mustaches which will inevitably be used as photo-props for those lacking in a ‘manbar’, and as annoying crumbs amongst the bristly hairs for those that have invested the time in looking like Ron Burgundy. Who am I kidding, unusual cookie cutter shapes are cool, and using the cookies as props would jazz up any Facebook photo album.